Sorry, no trial version available. Escape the clutches of a legendary monster in Nancy Drew: The Captive Curse. A terrifying myth comes alive in Germany! Many years ago a monster stalked the German forest surrounding Castle Finster. According to locals and storytellers, the monster disappeared when it claimed a victim. Now everyone is frightened by the sights and sounds of something large stumbling through the darkness. Can you solve the mystery before the monster adds another chapter to this legend? Nancy Drew: The Captive Curse is rated 4.0 out of 5 by 48. Rated 5 out of 5 by piano77 from Excellent Game I really enjoyed this Nancy Drew game. I found the puzzles pretty straight-forward and solved most on my own. Also, I didn't get stuck very often. This game really kept my interest and was just spooky enough to make it fun. Also, there are quite a few fun places to explore. In my opinion, this is one of the better Nancy Drew games. Rated 5 out of 5 by melantha5 from Loved it! I loved this game! I have played many (~15) of the Nancy Drew games and this has to be one of my favorites. In my experience with Nancy Drew games, whether I really "get into" the game often has to do with how interested I am in the environment, subject matter, and location. If you're interested in Germany, castles, or folklore, you'll enjoy this edition. My other favorites included Phantom of Venice and the Haunting of Castle Malloy - if you're a veteran Sassy Detective who liked either of those games, you'll enjoy playing this one as well. Loved the characters, loved the castle and grounds, the minigames, and "the monster". Lots of sleuthing fun! Rated 5 out of 5 by laranangel from One of the best! This game moved along at a good pace, had excellent visual appeal, and was challenging enough to keep me occupied for several days before I solved the mystery. Rated 5 out of 5 by earthgirl09 from One of My Favorite ND Games! I really think The Captive Curse was a great mystery game. The plot was interesting because it really captured the feeling of Nancy being in Germany. The characters are very talkative and interesting, and there were plenty of memorable quotes. The castle was large and there was plenty to explore. The graphics and music were both outstanding! One thing I disliked was the ending - I felt that the culprit's motive was weak, and I disliked the culprit choice. Besides this, I enjoy this game a lot and find myself replaying it often! Rated 5 out of 5 by Sergeij from I Was CAPTIVATED By "The Captive Curse!" This was my 23rd Nancy Drew game, and it is, to my way of thinking, one of the very best! All of the dark, lurking, monstrous, hideous things, found in other Drew mysteries, were present throughout this extraordinary game which took place, for the most part, in a German castle -- Castle Finster -- and Nancy had her hands full of suspects, secret passages, dungeons, codes, mystery inventory, and a bevvy of suspects. The puzzles were very challenging, and even frustrating, on occasion #the forest!#, but the game truly delivered! It was fantastic from beginning to end, and I'll include it in my top 5 all-time Nancy Drew best games! BRAVO, HER INTERACTIVE! BRAVO, BIG FISH GAMES!. Rated 5 out of 5 by LexusAmaru from Captivated by Captive Curse This is a great game, one of my favorite ND titles! The story is a bit darker than usual, and that helps the scariness factor. Humor in this one is great, and some new types of puzzles! A win(ner). Rated 5 out of 5 by bubbyc from One of my favorite Nancy Drew Games... I have played the entire series of Nancy Drew games and this is of one my favorites! Yes, there is lots of dialogue but that is part of the fun, you have to listen to catch the clues. I really loved the setting of this game, the castle was really cool. I think these were some of the best characters they have created. I played on the Junior level and the difficulty was just right, really fun puzzles. And the extra games in this one, Raid and Monster, are all my time favorites. I extended my play time because I wanted to keep playing them. To me, the Nancy Drew series is alive and well. Rated 5 out of 5 by HopeM2 from One of my Favs Nancy Drew is so much fun! The monster gives you a nice scare. Lots of mini games that can keep you entertained for hours. Good graphics. Just a lot fun! Rated 5 out of 5 by BlueFriday from Sleuthing with Nancy First off, yes... there is a lot of dialogue. However, that dialogue really does yield some important information that will ultimately help you to finish the game. You are also allowed to make bad decisions and potentially die in-game...so save! I loved the characters, and really felt like I got to know them through the dialogue and interactions. There are two ongoing mini (board) games that are thoroughly enjoyable. I still log into the game just to play them almost a year after first playing the game. The floor plan did take me a little bit to figure out as it is sometimes awkward to move, but once you learn the layout it is much easier. This game really sucked me in, and remains one of my favorites. I'm definitely a fan! Rated 5 out of 5 by Witty10 from Great expections - great follow through I've always been a Nancy Drew fan and when this game was released, I was a little wary- the last few had been a bit of a let down and my hopes weren't especially high that this wouldn't be more of the same. However, as I got into it, I was pleased to find that I had been wrong. This game, as well as the next in the series were a refreshing change from the couple games before them. The visuals are great, as is the sound and interface. Granted, every Nancy Drew game gets tedious at a certain point as you start putting things together and the checklist begins to dwindle, but they usually pick up again as you get to the "game changer" event in each game. I found The Captive Curse to be thoroughly enjoyable and would definitely recommend it, if this type of game is your fare. Rated 5 out of 5 by RyeMcLaughlin from Different and fabulous I've only played the demo, but this is a definite purchase for me. A true adventure game with you as the famous detective. This game has great (computer generated) graphics, superb voiceovers and a wonderful sense of humor. I've never played this type of game before. You don't have too much help (especially if you play as Senior Detective), so it's more work than your average HOG. You can't fast forward through the dialogue, there are no hints, and puzzles can not be skipped. There's no map, so I'll be taking notes, but I just want to keep playing. There are puzzles to solve (easy and hard), games to play, a castle to explore and a mystery to solve. So glad BFG is finally getting the Mac version of this series. 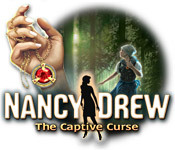 Rated 5 out of 5 by moonbeam3434 from Nancy Drew The Captive Curse ( Detective ) Excellent game! Yeah! Nancy Drew for Mac Games excellent choice big fish! I am a fan of Nancy Drew games and I am so happy to see it for my mac computer. 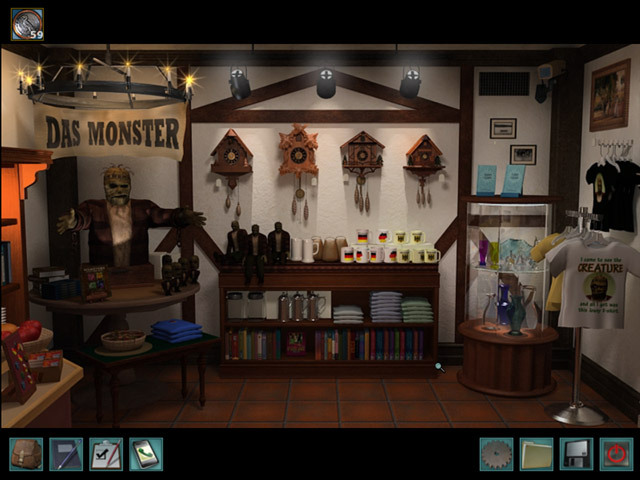 Nancy Drew games are a detective game you choose what level you want to play. You help her find and solve mysteries and find the person behind these mysteries. 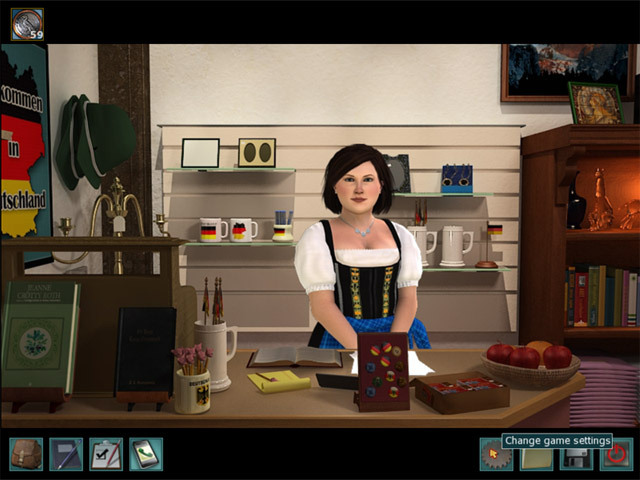 Rated 4 out of 5 by HauntedDoll from Fun Bavarian Gothic Mystery I have played 8 Nancy Drew games so far and this is one of the gentler ones. I found the navigation a bit tiresome, as it's easy to get lost in both the castle & especially the forest - I recommend saving the game before entering the forest, so you can reset if you get lost. They should've given Nancy breadcrumbs to follow! Lovely design, heavy on dialogue, but great mini games & challenges as usual. An enjoyable way to give your brain a workout! Sehr gut! Rated 4 out of 5 by applecocaine from great addition! I LOVE the Nancy Drew series and have played almost all of them and have been doing so since I was just 12 years old. This one is a really great addition to the collection. The replay value isn't as strong as say, Message In a Haunted Mansion, but it does have the heir of the games gone by that are my favorites in the series. Worth a play! Rated 4 out of 5 by hatzic from Loved it. Hated it. My dislikes of this game had nothing to do with the length of, or inability to skip, dialog. In fact, I found the voice talent to be really good, fun and refreshing and really hamming up their roles. 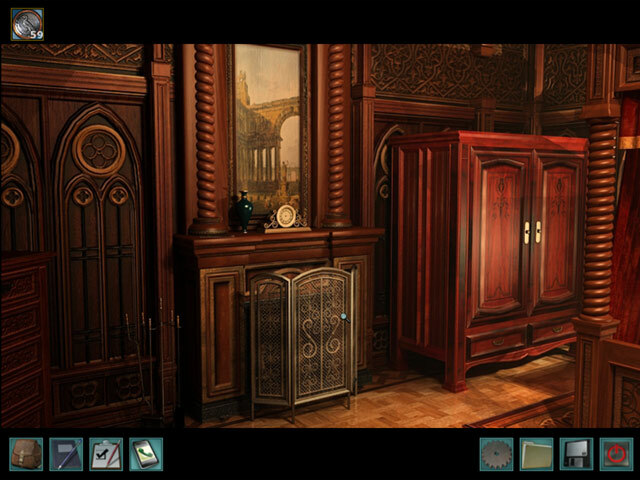 This game plays like curling up to watch your favourite mystery movie or read a novel. Put on the popcorn, sit back and take over the investigation as you wander a castle, exploring the rooms and grounds and meeting people and finding clues. What else?! I decided to play Junior Detective, as I've played other ND games and knew I'd probably get frustrated at some point - don't have to use the clues, but nice to have in case. The game gave you a journal, a task list, and a phone with a hint feature. This was a game I couldn't wait to get back to playing at the end of the day. OMG I had so much fun playing this game! At first. Then at some point, just as the game was rolling along it just stalled. I got to a part when I wasn't sure what to do next and I tried to get a hint, and there wasn't anything. I had exhausted every conversation, played every game, re-explored every area, phoned every person. I looked everywhere in my tools (inventory, journal entries, phone numbers, tasks, suspects, notes, etc.) for some sort of clue of what my next objective was, and what I needed to move in that direction. But there were no hints and only vague objectives (Look For Something Dealing with The Frieherr's Daughter). ?? I expected that if I clicked on a super vague task like that, perhaps it would open up more and more specific hints, but there was nothing. And unfortunately the phone Hint feature was mostly blank(!) and only has hints available for certain puzzles in the game. The dossier, journal, task list, suspects, observations were all kind of lame and also became static about mid-game. There was a point in the game where every single task in the game was checked off, and no hints available. So after running down every hunch what do you do next? And Ned! You have some sort of stupid fight with him for some reason, then you make up, really quick in the beginning of the game. He offers you lots of hints (optional dialogs) when you call him. At first. I chose not to use them at the beginning of the game. Then later, when I called Ned desperate for a hint, he had nada, and basically petered out on all conversation after that. So I was stuck so bad, frustrated and annoyed, I had to step out of the game and find a walkthrough, which ruined the enjoyment of the game for me. The logical detection I was successfully engaged in in the first half of the game, just dissolved. The smallest of hints would have probably sufficed. The things I got stalled on (as I discovered by the walkthrough) were so obscure that I wondered how in the world I was supposed to figure that out? Especially without little hints to propel me at least in the right direction, or a hint that I can deduce the answer from. I don't want to be told the answer, I just want another clue. Another thing that was strange about the game was it seems to take place all in one dark and dreary evening, so it is perpetually dark out. Later you see a static image of the courtyard in daylight and it's beautiful! I would have loved to explore it in the daytime. Anyway, because a graduated hint system was not part of this game (as I think other ND games offer? ), nor was the Hint Feature of any reliable help, this great game kind of let me down. However I did guess the Whodunit correct in the end. And the voice actors were pretty awesome. All in all I'd have to recommend, because it was so much fun to play (at first) and if you are smarter than a Junior Detective you won't have the issues I had! Rated 4 out of 5 by ipluto from A pleasure to play I usually only find hidden object games listed under "Adventure" on this site, but I was very happy to have found this one, where you can really explore and interact with developing characters. I thought the graphics were great and I loved how you could discover things in a way that was not so obviously linear. The mini-games were also different and entertaining, and the sense of humor of this game was great. If Big Fish Games included more games like this, I would be back much more often. Worth the download! Rated 4 out of 5 by spenny1 from Are you sitting comfortably? Well I thoroughly enjoyed this game, although before I played it, I was a little concerned after reading reviews saying that it has too much dialogue, personally I didn't find this to be the case. The characters are well rounded, with distinctive personalities, and you have to take clues from the dialogue to solve the case. I guess if you view this as an interactive story, and are happy to enjoy the ride, it probably won't be a problem for you. I understand this might not be for everyone, but it really does make the game play a richer experience story wise. People have already talked about the game contents and story, so I'll just add a few of my own comments. OK, so it's not really a new story, but it did keep me engaged, and I always felt as if I was doing things for a reason, and progressing in my detective duties. The two ongoing board games are fun, and I really enjoyed the Raid game, and went back many times. The puzzles were good Nancy Drew standard, and a couple had me scratching my head for a bit, but perseverance paid off (and taking a break now and then!). I even managed to find an 'Easter egg', totally unaided, which was a lovely surprise. It didn't take me long to get my bearings in the castle, but the forest and the maze can be a bit of a pig. There are maps to be found in game, but I have to admit to sourcing my own before came across them. I also let out a massive groan when I discovered, right near the end of the game, that I didn't need to dial my own phone numbers, you can just click which one you want from the list, doh! I thought the music was lovely, and the atmosphere just right. I'm not up on German accents, but I did enjoy talking to Lucas, and thought the way he told his 'secrets' was very cute. If you enjoy Nancy Drew, I don't think you'll be disappointed, and even if you haven't played one before, give it a go (I'd recommend junior detective mode). On to the next one now I think. Rated 4 out of 5 by tholmes2 from Not Bad I really liked this game and I have tried all the Nancy Drew Games so far, ohh except the Twister one, anyways, this was a great game, the puzzles were a little challenging, but not bad, the only thing I hated was the Forest Maze and the Well Maze, grrrrrrrrr those two drove me batty!! If it was not for a walk though with a map I would have quit. Rated 4 out of 5 by silkhoney03 from Typical Nancy Drew! I love all things ND, so I'm a little biased! I thought the storyline and puzzles were superb! The tasks were right in line with the plot, so Nancy wasn't sent on some useless errands that had nothing to do with the game. It is captivating and extremely entertaining. It is a bit time consuming, so if you don't like to immerse yourself in gameplay, then this one's not for you. This isn't some quick, third grade spelling test, easy as breathing game. It takes a lot of time and work. But once you get the hang of it, you'll be hooked. Rated 4 out of 5 by Dinointhesun from ND - Gotta Love It This game was nicer than the previous ones. It does take you from room to room and sometimes you feel like, hey I didnt see that early. But if you are a true ND fan you will enjoy it. I know I did greatly. You always experience a new board game of type, this one is no exception. I wasnt really sure how it was to work but it was interesting. Rated 4 out of 5 by teiganelyse from dialogue dilemma This game was great! I loved the overall feeling, and the character's accents were very fun to listen to. However, the HOURS AND HOURS AND HOURS ( or what seemed like hours) of dialogue just bored me to death! The talking was unnecessary, and I wish they'd spent more time giving me puzzles or challenges than coming up with so much dialogue! Rated 4 out of 5 by Rebr2009 from Very interactive and challenging game. You are Nancy Drew and will investigate the reappearance of a mysterious monster that terrorized a town in Germany years ago. Two play modes: junior and senior detective. I played Junior, because ND is not familiar to me, that was the first I played. Game not linear, which means that you choose where you want to go. Explore the castle courtyard, castle foyer, gift shop, Nancy's room, Karl's office, etc and talk to the characters you find along the way. The conversations are long, but in some cases, you can choose to finish faster. There is a cell phone, a bag (inventory), a journal, a task list and... no hint button! Sometimes I got lost! You have to collect coins throughout the game, and will need them! Some are well hidden ... Tip: load the bucket into the well again and again ... you'll see why! Several mini games, as secret messages to decode, secret passages, slide puzzles, etc. Great graphics, excellent VO. If you've played ND, will like, if not, worth a try! Rated 3 out of 5 by niloc031298 from The Captive Curse Good, but its a little bit off. All the characters don't really fit into the environment and there is too much dialog. The plot is a little disjointed. The setting is nice though, and the graphics are good. Rated 3 out of 5 by Mrs_Kim from Not a favorite I bought this game because I love ND game series but this game is certainly not to my expectation. The preview of this game from the previous game, Shadows at the Water's Edge is so convincing but in reality it doesn't deliver. Like what monster? The game is set in Germany, but the game takes place at nighttime and never goes to another morning although ND has her own room. She can only go to a few rooms in the castle and the woods. The passageways are a bit creepy but nothing scary to make me jump from my seat. The length of the game is fine but maybe because it has so many conversations with the characters which are super long and tedious, and they are not likeable either and too bad the conversations cannot be skipped. I hate having topics of relationship problems in this game. ND should act professional and the conversation about boyfriend problems just weren't necessary. I think the devs just want to make the game look realistic in real life, but to me it just looks amateurish. The difference with real life conversations like the one in Syberia just wasn't delivered nicely here. Fortunately the puzzles are few here and some are the most creative I have ever seen. The last part where usually ND explains in her final letter doesn't fully explain like why there's a monster in long time ago, what happened? And final confrontation with the culprit is so hu-hum.. not interesting and no rush feeling either. I have high hopes with this game but left disappointed. Rated 3 out of 5 by Brooke_Lyn from Captive? Curse? I Must Have Dozed Off? After just finishing Blackmoor Manor I played Captive Curse. At first I thought I was being prejudice and just comparing the two and it would get better. Hum hum hum-mm NOPE! It dragged on and on.. Way to much dialog (sort of like my review) before you really get to do anything and you don’t really do much worthwhile. The plot could have been good considering the Castle and location in Germany but fell flat and is lacking any iota of suspense. The castle is far to big for a game with the minimal locations you visit so plan on getting lost inside and out! I had to look at the walkthrough to get out of the forest, So I thought.. The L-R-F etc. apparently are misprints because some Fwds are not possible you have to turn left or right so you’re on your own out there and end up back where you came from A LOT! Even “The Master” of youtube walkthroughs got lost! You are not put under time constraints or clock setting which I did like.. You usually learn new things in ND games but Monsters, Really? For me It was long and dull. I read the reviews and most people loved it? It's all a matter of taste I guess! If I list some positives for me it would be Lukas, I did enjoy the conversations with him but he became a negative too! Catch 22.. The graphics are so phenomenal in this game (huge kudos to whomever did them# you feel like you’re talking to a real boy with no friends, as opposed to a computer generated one. I couldn't help but stop and play a game with him a few times when I accidentally passed his location. Yes, I know Lukas isn't real.. '-) The Devs did a great job inserting emotion into some of the characters and pulling out the Mommy will play with you in me. LOL The security booth was a fun gadgetry location to be in but it‘s such a small part of the game. There is the secret passageway ways?? But minimal again and no, you won‘t get lost.. However the forest is a whole different story!! Most of the game is dialog with the characters at the castle or via phone calls with some sleuthing and puzzles thrown in that even I could do? And a lot of getting lost. If you’re looking for someone to talk to #or listen to# then I do recommend this game and the character Renate whom if I remember since I’m already forgetting this game.. is a traveling story teller. You could spend hours chatting with her! She does have “SOME” interesting things to say if you loved history, you might enjoy it! She is the "Insert learning into game" part! Again the Devs made you feel bad for her at times! She looked weary so I did make her sleep with a slice of cake more times than I needed to. Yes, I also know Renate is not real.. '-) Well, that’s enough about my time at Castle Finster! As far as recommending this game, I won't say yes or no just because it was a no for me. Rated 3 out of 5 by cuthillh from Interesting mystery but it drags I thought the mystery itself was intriguing and the puzzles were sufficiently challenging, but the never-ending dialogue bogs the game play down and there doesn't seem to be any way to skip to the next line to speed things up. I enjoyed the voice actors, the characters were interesting. I particularly liked Lukas and Renata. But I found the navigation to be clunky and awkward and sometimes confusing. I would appreciate some shortcuts so I don't have to cover the same ground over and over and over and over and over again. For much of the game the Hint Hotline was useless. And I really don't care about Nancy and Ned's relationship so that just made for annoying interruptions to the flow of the game. The phone conversations with Frank Hardy were also quite pointless. Rated 3 out of 5 by stephensol1 from Too much dialogue Love the series but the developers really need to find a way to speed up the dialogue in these games. Most of it isn't necessary to the plot and not entertaining. I lost patience by the end. Ruined the game for me. Everyone is frightened by the sights and sounds of something large stumbling through the darkness. Can you solve the mystery before the monster adds another chapter to this legend?